Full stops are silences that give meaning to sentences. Without a full stop, the previous sentence wouldn't make much sense, and nor would this one, or even the next one, for that matter. And, as he demonstrated quiet eloquently (ha!) in Lootera, Vikramaditya Motwane fully understands the import of these silences. So much so that he's almost made quietude into a language - one in which romance thrives and reaches its highest potential. And that's Lootera, a film in which you can differentiate between silences that throb with passion and those that invite you to sit down and wallow in contentment. Then there are those that speak of bemusement and betrayal. A petulant obmutescence precedes a calm that surrounds you like the gentlest sunshine. The dead air of hopelessness is followed by a joy that pervades all that it touches, despite its wordlessness, or perhaps, because of it. You see, in Lootera, the spoken word is used in order to punctuate the silence, rather than the other way round. The year is 1953, and the place, well, it used to belong to our heroine Pakhi (Sonakshi Sinha), the pampered daughter of an erstwhile zamindar unable to deal with changing times. Pakhi is lovely, headstrong, and possesses a strange mix of innocence and guile that comes from being sheltered but well-read. One fine day, a handsome young man, Varun (Ranveer Singh), rides into her life, and manages to insinuate himself into every facet of it. Until heartbreak and illness walk in. What does it take to make a person resigned to death want to live again? A hatred as passionate as the love that's on the other side of the coin? Or a love that takes advantage of the very same hatred to get what it wants? And, did O Henry's lovely little tale (The Last Leaf) really need such an elaborate back-story? Don't get us wrong. Lootera smote us from the word go, just as he smote the zamindar's daughter. There's very little that satisfies as much as watching two people fall gradually but relentlessly in love. However, all that angst and drama that surrounds this story of star-crossed lovers takes away from the simplicity of The Last Leaf. However, that's just nitpicking. The film is technically near-perfect. Sonakshi Sinha and Ranveer Singh are surprisingly good choices for their respective roles. While they get plenty of help from their costumes and the wonderfully pliant camera, they also get the chemistry just right, with Sinha's air of brash vulnerability perfectly matching Singh's swashbuckling assurance. Under Motwane's masterful hand, the aforementioned camera, the sound, the lack of it, the birds and the bees, and even the very winds do just what they ought. And what a wonderful medley it is! When leaves falling from a tree move you, there's some serious magic going on there. The songs are just as beautiful as the rest of the film. You will constantly find yourself humming Sanwaar Loon for days. And that's an earworm you will want. 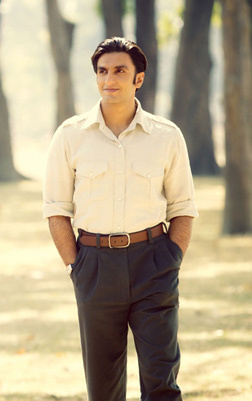 Watch Lootera, and take your significant other. Romance in all its shades rendered so affectionately is not something you get to see every day. Brilliantly written review? :-). The intended pun cannot exist, since the right turn-of-phrase is 'quite eloquently', and not 'quiet eloquently'. :-). It sure is interesting that others here want to 'learn', and they're welcome to do so. Forget bout the movie, but the review is awesome. The choice of words, arranged in the way, I find wanting some words to describe how I feel. Can the writer start an English class so that I could be the 1st to enroll. fullhyd.com has 700,000+ monthly visits. Tell Hyderabad what you feel about Lootera!